For several months, we have had an unusual looking "card" that features Joe DiMaggio sitting on a desk here in the office. Up until today, we had no idea what it was. One of the most interesting aspects of the card is the hole punched in the top left corner, which made the card look like it was hanging onto a piece of merchandise, particularly clothing, at some point. 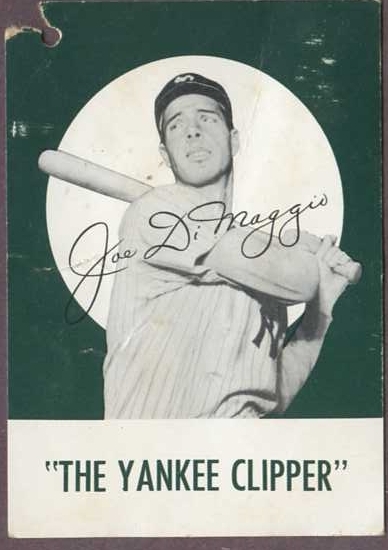 One of our inventory managers did a little research and discovered that it was in fact a tag that had been hanging off the laces of one of the shoes with the brand name "Joe DiMaggio Baseball Shoes". These baseball cleats, which can be seen here in this lot sold by Hunt Auctions, were originally made by Endicott Johnson and would have probably been sold in the early part of the 1950's. 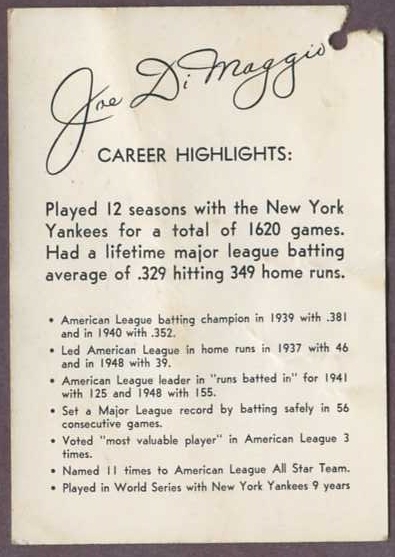 In terms of advertising, DiMaggio would be best remembered as the Mr. Coffee spokesman.